FAQ: Can a light sensor be used with electric blind motors? A sunlight sensor with a photocell can be used to activate our radio equipped blind and shade motors using RF (Radio Frequency) for transmission of a remote control signal. This is a four part article series on how to set up a light sensor. The MCS-1-RF wireless wall mounted light sensor transmits the radio signal to a small antenna in the motor, where a microprocessor decodes the signals to operate the blind motor. The sunlight sensor is able to respond to sunlight, general daylight or artificial light. Our multi-channel hand held remotes have up to 14 channels that can be programmed to control blind motors in various different rooms and hallways throughout the house. These remotes transmit the same signal as the light sensors and can be used in conjunction with them. 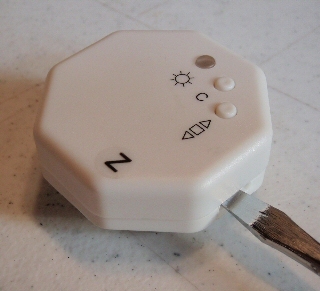 You can also use this sensor with a timer for light sensitive operation of blinds & shades AND timed operation. The first step in the setup of these light sensor switches is to remove the cover, exposing the battery compartment, a concealed setting switch, a test switch, and a mode switch. There are two slots on either side of the light sensor that accept a flat screwdriver blade. When you rotate the screwdriver blade in each slot, it will pop the clamps inside the unit, releasing the top cover. You can then lift off the cover, exposing the battery compartment, the setting switches, and the light threshold adjusters. Note that the light sensor itself is on the backside of the unit, inside the transparent suction cup. 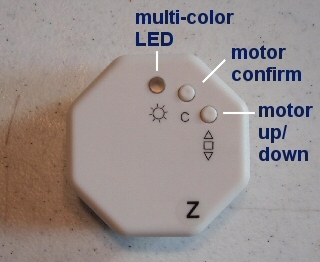 When you mount the unit on a glass surface or window, the controls are facing you, but the light sensor monitors light conditions on the opposite side. The correct orientation of the unit is for the multi-pole DIP switch to be on the right, with the battery compartment at the bottom of the circuit board. The battery itself (supplied) is a standard 3 volt button battery unit and will be marked with a positive (+) (top) and negative (-) (bottom) terminal. The battery should be inserted with the positive (+) terminal facing up - in the picture, you can clearly see the + designation at the top of the battery, just below the back of the light sensing component. 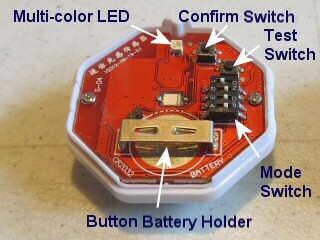 After the battery is inserted, you can press the test switch to confirm proper operation - the LED should flash when you do this.